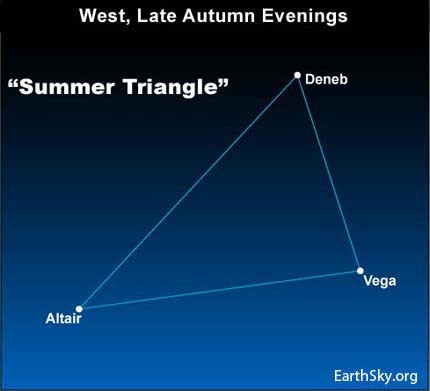 The Summer Triangle – the signature star formation of summer – is made up of the three brilliant stars Vega, Deneb and Altair. Although December is just around the corner, the Summer Triangle still lights up these autumn evenings. What’s more, the Summer Triangle will continue to shine after dark throughout December and January. 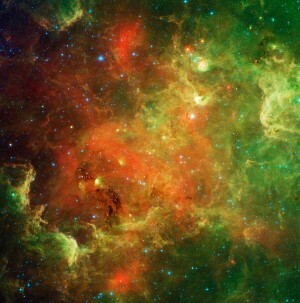 Look for it at early evening, fairly high in your western sky. In late June – around the June 21 solstice – the Summer Triangle pops out in the east as darkness falls and shines all night long. Presently, the Summer Triangle appears quite high in the west at nightfall. As evening deepens, the Summer Triangle descends westward, with all three of its stars staying above the horizon for several hours after dark. Depending on where you live, Altair – the Summer Triangle’s lowest star – will set around 9:30 to 10:30 p.m. tonight. Notice where you see the Summer Triangle at a given time this evening. The Summer Triangle will return to this same place in the sky some 4 minutes earlier with each passing day, or 2 hours earlier with each passing month. As the Summer Triangle sinks low in the western sky around mid-evening, turn around to see Orion – the signpost constellation of winter – rising in the east.